When the Titanic started to take on water just after hitting an iceberg, water pumps below the deck worked desparately to keep up with the massive amounts of water flooding the ship. The pumps were no match for the rapid flooding, and the ship was overtaken. Right now, UFC fighter Joe Stevenson is like the Titanic -- trying desparately to right himself in a deep sea of fighters. Stevenson is in the process of making his second weight class drop, taking his talent to the 145 lb. division. 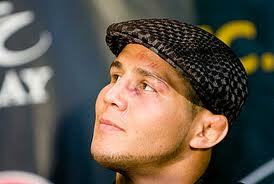 Joe Stevenson won The Ultimate Fighter: Season 2 welterweight competition in 2005. Stevenson made the cut to 155 only two fights into his UFC career, spawning a four-fight win streak which set up a title meeting with BJ Penn, the lightweight titleholder at the time. After loosing to Penn, Stevenson would go on to compile a lackluster 3-6 record, of which he currently rides a three-fight loosing streak. Intelligently, Stevenson decided to drop down to the featherweight division. He will make his featherweight debut against skilled BJJ black belt Javier Vazquez at UFC Live: Marquardt vs. Story on June 26. It's no surprise that certified veterans like Stevenson and Florian would make the cuts to featherweight. The UFC's lightweight division has been overflowing since the UFC-WEC merger that took place last October. Moreover, most would probably agree that Stevenson has more than enough pudge to make the cut, and could probably even make a drop to bantamweight if he tried. But for now, a drop to 145 lbs. is a fair attempt at 'righting the ship.' Still, it won't be an easy course when there's Mark Hominicks, Mike Browns, and Jose Aldos down the stretch. Joe Stevenson is venturing into new seas, and he'll really have to fight hard in order stay afloat.